Out today in North America and Europe, Retro City Rampage is, as the title suggests, a WiiWare release that aims to remind us of gaming's older days. Inspired by the original GTA, it includes a host of jokes, references and areas designed to bring to mind pop culture of the '80s and '90s. 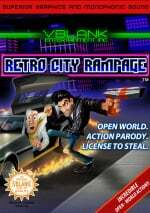 Also included with the WiiWare release is ROM City Rampage, available in the Arcade area; it represents a version of the game that would actually run on the NES. For those with an interest in the retro system and the kind of processes that developers may have used when creating iconic games, Vblank Entertainment has produced a ten minute documentary that explains the specifications of Nintendo's first home console, and how this extra was developed. If you want an insight into the limitations in pixel density, or why NES games "flicker", the video below is well worth your time. Looking forward to playing this tonight! 57 blocks? I can't believe it. Awww yeah! I must get this! I love the old school references in the game. This guy reminds me of Christian Bale's character in American Psycho. So many pop culture references and only 2 chapters in...I wonder how many younger gamers would twig the early SMB2 dream sequence parody? Not simple to have ever witnessed those end credits without a game genie or before youtube! So far, the Arcade challenges is all I have played. I like what I've played, though. this game is way huger than sliced bread. totally amazing, get it now. Hey @Chukie-Doll I used to love Super Mario Bros 2 when I was a kid. I remember when I got to the end boss Wart I actually called my Mum and Dad in to watch me in my moment of glory. I was 9 btw. I tehn promptly lost and my parents were non-plussed. Anyone tell me if this is being released in Australia, or do we miss out again?